As we have system properties feature in SOAtest how to use same feature in CTP. i am not sure whether this feature exist or not in CTP but can anyone let me know. The System properties are specifically for configuring the Eclipse and internal Parasoft configurations for SOATest and Virtualize instances. These settings are not needed in CTP, therefore a localsettings file is not necessary or available for CTP. 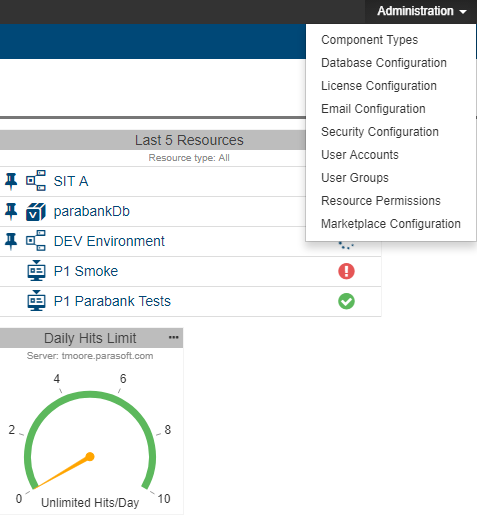 If you would like to configure CTP settings, you would deploy a CTP instance, add a license, and navigate to the "Administration" drop-down for the configurations webpages. I am in need of system properties to configure class path as it does not take any class file which I am putting under folder created in CTP. any idea about this, how to configure classpath to execute java code inside CTP. CTP does not execute the Java script itself, SOATest executes the scripts, therefore the Jar needs to be added to the SOATest classpath. The System Properties panel lets you add JAR files, class folders, and Java projects to the classpath if needed. Use the available controls to add or remove JAR files, class folders, and Java projects. The specified JAR files, classpaths, and Java projects will be added to the system's classpath and the corresponding classes will be loaded into the JVM after SOAtest is restarted. To force SOAtest to reload classes from the classpath entries, click the Reload button. If you want SOAtest to attempt to reload classes from your Eclipse project after being modified or recompiled, enable the Automatically reload classes option.